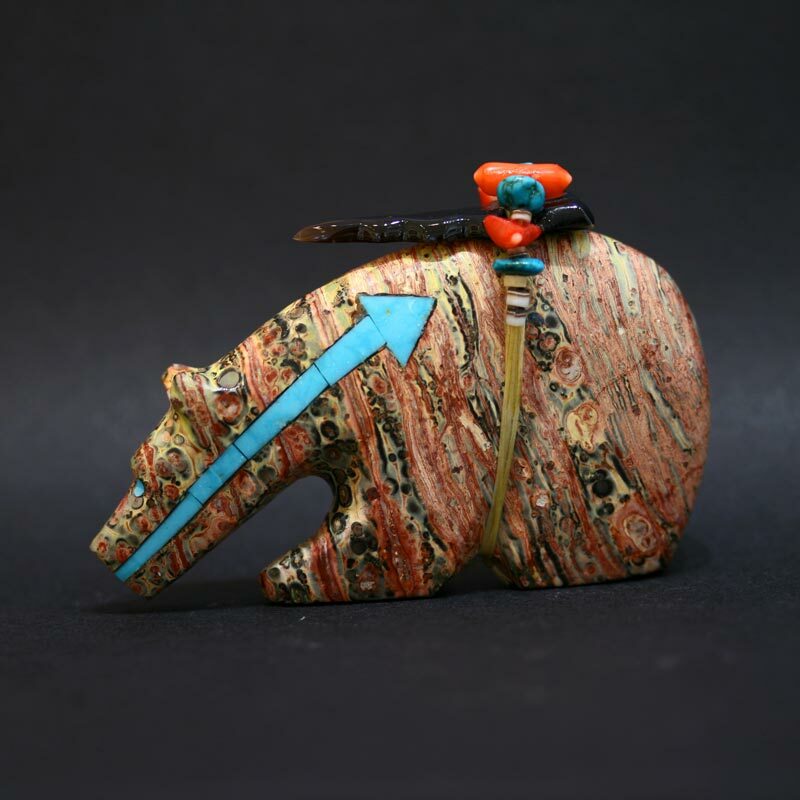 This magnificent bear fetish is carved from richly coloured strawberry serpentine rock by Donovan Laiwakete and inlaid with a broad turquoise heart line or spirit line. This bear fetish is protected with an arrowhead, red coral, turquoise and shell. 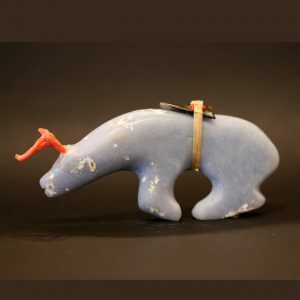 This splendid Zuni bear fetish measures 8cm in length and 5.3cm in height. 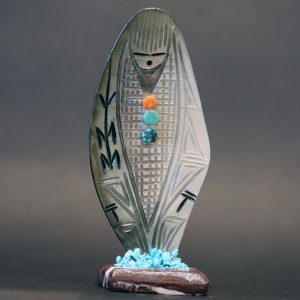 The Zuni People are known for their fine pottery, jewellery and also for traditional, miniature animal and bird carvings known as ‘fetishes’. This purple bear carving is a fine example. A fetish is a ritual object, empowered by ceremony and imbued with spirits. Such power objects are believed to assist in healing, hunting, fertility and protection. Zuni Fetishes are animal carvings that have been used by the A:Shiwi (The People) for over a thousand years. Originally fetishes were found objects that resembled animals and were then adorned with arrowheads, turquoise, coral, shells and feathers. Sometimes these natural forms were further enhanced to emphasise the appearance of the animal spirit within. Zuni fetish carvers gradually enhanced this process to develop a carving tradition of beautiful, characterful and sometimes intricate ritual objects. The carving of a fetish is a way of honouring the animal spirit. By honouring the animals and acknowledging their special “medicine” or natural gifts, we can recognise these attributes within ourselves. When wearing or carrying a fetish or placing it carefully in our homes, we can focus on certain animal like qualities. Fetishes maybe used to discover, enhance or simply remember a connection with nature. They remind us of the instinctive wisdom of the natural world and all that we can learn by respecting and living close to nature and observing the ways of animals and birds. The Zunis feel that it is the spirit within each fetish that is of value, rather than the object itself. Therefore, fetishes are treated with respect and occasionally given offerings of cornmeal. Today many Zunis make their living carving fetishes that are also exquisite works of art in their own right. Certain families and individuals are highly regarded in the tribe for their fetish carvings and their pieces are particularly are sought after by collectors. Carvers often favour a particular animal, perhaps influenced by a tribal connection such as clan affiliation. 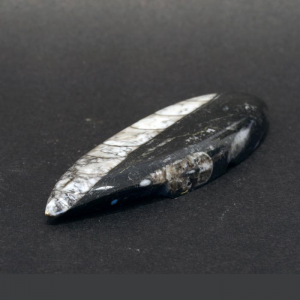 The materials used are usually local rocks such as Zuni rock, serpentine, picture jasper, dolomite turquoise and jet but other materials are readily employed when available – deer antler, corals, shells and fossils as well as pipestone, onyx and lapis. Zuni is the largest of New Mexico’s nineteen Indian Pueblos with more than 600 square miles of reservation land and a population of over 11,000. Zuni is considered to be one of the most traditional of all the Pueblos. Zuni has a unique language, culture and history that has resulted in part from geographical isolation, being located much further south than the other Pueblos. The Zuni Nation has its own constitutional government, courts, police force, school system and economic base. Around 80% of families are involved in the creative arts.